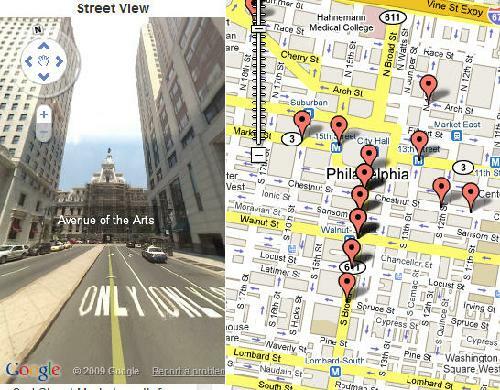 Step back in time and explore the Philadelphia of yesterday using the Free Library of Philadelphia's Historical Images of Philadelphia digital collection with Google Maps. A portion of our records have been geocoded to include latitude and longitude, and when you view an image from our collection on Google Maps, you can see the image, its description, and where it was taken. Not sure where to start? Try selecting groups of images by neighborhood using the checkboxes located at the top of the page. You can also compare the digital collections image to the current street view of a location and see how much an area has changed over the years. There are a little more than 100 images currently available —as we add locations to more images from our digital collections, they will begin to appear on this map. So be sure to check back periodically to see new additions! 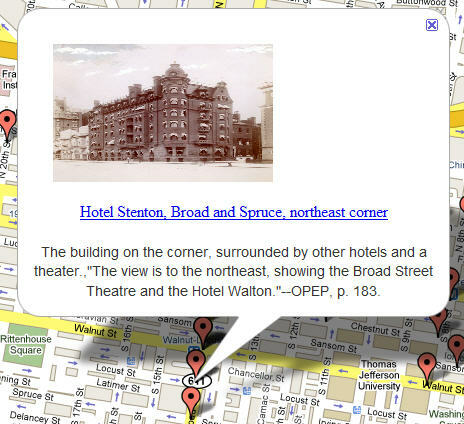 There's been a bit of discussion on genealogy mailing lists recently regarding historical overlay maps available for Philadelphia Google Maps. This technology has actually been in use for some time, with historic overlay maps first as i available for Google Earth back in 2006. The premise behind these historic overlay maps is that they are layered directly on top of current road maps and/or satellite images. By adjusting the transparency of the historic maps, you can "see through" to the map behind to compare the similarities and differences between old and new maps, and study the changes in your selected location over time. A great tool for genealogists!